A powerful desire for something. Craving is a simple word but can drive you to nuts if it decides to settle in. Like my 4 and half year old it could be really nagging at times and refuses to give in if you don’t give it enough importance to satiate your taste buds with what it is craving for. Trust me, Its not everyday that you crave things but when you do its better to go that little extra mile to have it. 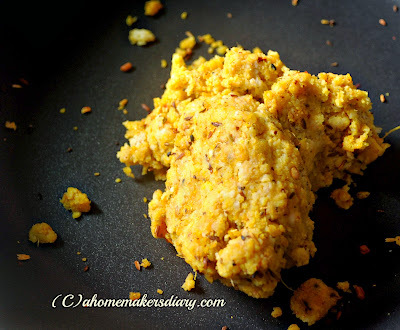 For quite some time I was craving for that simple breakfast of hing er kochuri and mishti dokaner alu die cholar dal, which is very common in my hometown Santiniketan. You go to any sweet shop before 10 in the morning and you will get crispy flaky asafetida flavoured fried bread with a ladle full of sweetish Bengal gram dal curry. 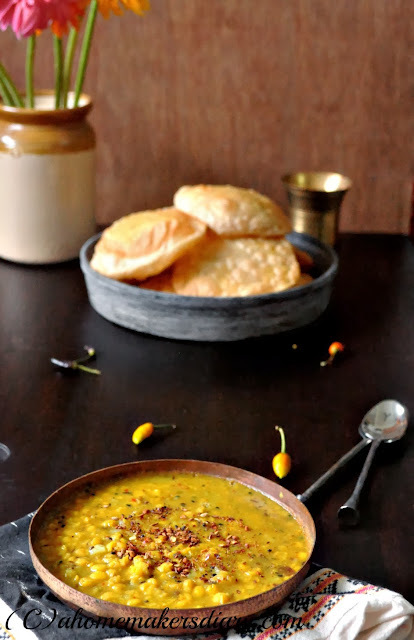 All you need is to tear a small piece of that kachori, dip it in that bhaja masala scented dal and have it…pure bliss in every mouhfull. Remember the sweet shop I talked about here, they used to prepare awesome Kachoris when we were growing up. The shop has closed down a decade ago and my next best bet these daysis a quaint little sweet shop in Shaktigarh called Lyangcha bhawan. For all of you who do not know, Shaktigarh is a small town on the National Highway 2, before Burdwan. This town is famous for Bengali’s favourite sweet Lyngcha. A deep fried cylindrical sausage shaped dark brown mishti made of fresh cottage cheese and milk solids and then dunked in cardamom laced sugar syrup. This mishti has a thick brown outer layer and soft pillowy inner that makes every Bengali dream of having a break there on the roadside shops of Shaktigarh. The whole stretch of the highway in this town is dotted with numerous sweet shops with the word Lyngcha in its name. In the first half of the day they prepare Kochuri and cholar dal as breakfast for all the passengers and passersby. Every time we need to go home we take this route just to have these amazing out of the oil flaky and spicy kachoris with the lentil curry. The curry is simple. 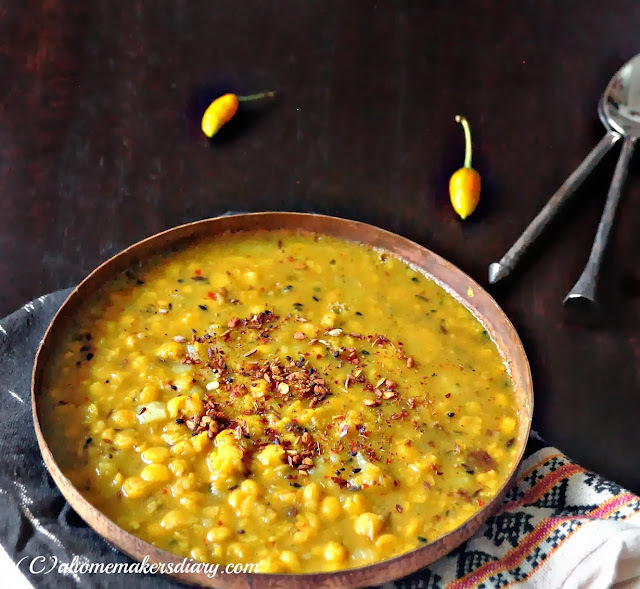 Boiled Bengal gram or chana dal cooked with cubed potatoes (with skin) and flavoured and tempered with plenty of panchforon, lightly pounded with skin ginger and bhaja masala. 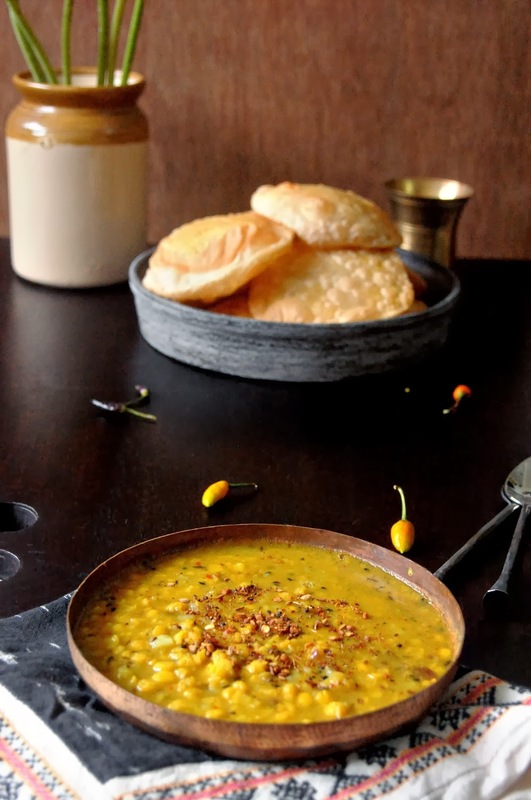 Dunking the flaky fried breads in this dal is a simple pleasure and for quite sometime I was looking forward to repeat that experience. But here in Kolkata I just dint know where to go to get them. Us with our hectic weekday morning schedules and lazy bum weekends just don’t go out much looking for breakfasts. So when the craving settled in and refused to go away, being true to myself I drove the husband crazy and sent him to the nearby sweet shops including the very famous ones in search of kochuri-cholar dal. But every time I opened the packets, I was disappointed to see the potato curries. Lets not delve into discussing the tasteless, unsalted or overtly hot curries but it made me miss the whole affair much that I so craved for. So on our Birthday this Mahalaya (yes we share our birthdays too J) I decided to recreate the magic at home and so glad that I did. It was amazing if I can say so myself. Soak the urad lentil for 4-5 hours. Drain the water and grind it to a paste (smooth but with few bits of dal in it) with the green chili. Try not to add any water while grinding or you will have to cook it longer. Dry roast the fennel seeds on low flame till aromatic and pound it to a coarse powder. In a non stick pan heat the oil and add the cumin seeds, once they start to splutter add in the hing. It will bubble up, after 4-5 seconds add in the ginger paste and a pinch of salt. Cook on low till aromatic. Mix in the lentil paste, little turmeric and salt. Cook on low and stir continuously. It will take 6-8 minutes to get the paste cooked and dry. Be patient and keep on moving the mass to avoid burning. Mix in the fennel powder and adjust the salt. Cook for 2 more minutes and then switch off the flame. Mix in the bhaja masala and bring everything together. Take the whole wheat and all purpose flour in a wide vessel or plate and sprinkle the salt. Pour the oil and bring everything together. Add little bit of water at a time and start kneading the dough. Keep on adding water till you get a nice pliable non sticky dough. Knead it for 4-5 minutes till the dough springs back when lightly pressed. Smear the 1 tsp oil on it and cover. Keep aside for at least 30 minutes. round ball. Flatten it little and then make a dent in the center (please follow the method described HERE) and place a marble size or little bigger piece of stuffing. Bring the sides together to cover the stuffing and roll to make a smooth ball. Repeat with the rest of the dough. Keep tightly covered. Heat enough oil in a kadhai or a deep pan for frying the kachori. Lightly oil your rolling surface and the rolling pin. Place the stuffed ball on it and lightly oil. Press to make it flat and then start rolling it carefully. Make a 3-31/2” round disk of each ball and fry them immediately. The temperature of the oil is very crucial. Let it heat up first and check by dipping one side of a kachori. If it bubbles up or sizzle hen the oil is ready. Keep adjusting the flame to keep the heat proper. 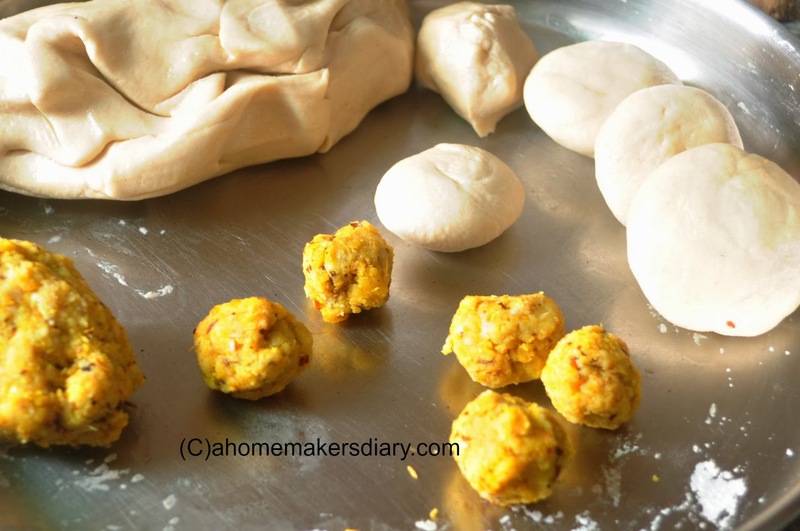 Carefully slide one kachori inside and with a slotted spatula gently press in the middle. The kachoris will fluff up to give you that flaky texture. Fry tilll golden or light brown on each sides. Take out and serve hot. Soak the lentil for at least 2 hours. Then pressure cook it with 2 cups of water, pinch of turmeric and ½ tsp chopped or pounded ginger on high flame for one whistle. Keep the lid on for 5 minutes and then using a big spatula gently release the steam. The idea here is not to overcook the lentil to mass. Alternatively you can cook it in a kadhai till soft but not mushy. Wash the potatoes under running water and soak for 10 minutes. Scrub the skin to get rid of any dirt. Cut them in small ½” cubes. Dry roast the spices under Roasted powder on low flame till they are aromatic and pound to a coarse powder. Keep aside. Heat the oil and lightly fry the potatoes with a pinch of salt and turmeric. Take out and keep aside. Temper the same oil with panchforon and dry chillies. Let it splutter and turn brown (approx. 30-45 seconds) and then add the pounded ginger. Cook with a pinch of salt for a couple of minutes and then add the boiled lentil. Tip in the fried potatoes, turmeric and mix. Add ½ cup water, adjust salt. Cover and let it simmer on medium till the potatoes are cooked through and the dal is thick. Lightly mash few pieces of potatoes with your spatula. Sprinkle the roasted spice powder and sugar. Adjust the taste and serve hot with kachoris. Since it was our birthday I had to cook some rice pudding (Payes). Enjoy your heavenly breakfast or brunch and thank me later! Sending this to MLLA:64 being hosted at spicy food, originally started by Susan. to another event hosted by Spicy food called it's birthday party time. to festive treats hosted at cuisine delight. Kochuri and cholar daal,omg makes me hungry again, just finished my dinner and am hungry here. 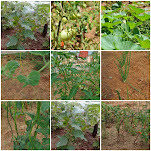 `Healthy dishes.. looks fantastic..thanks for visiting my site & lovely comment..
wow this daal has to be made asap in my kitchen as well. 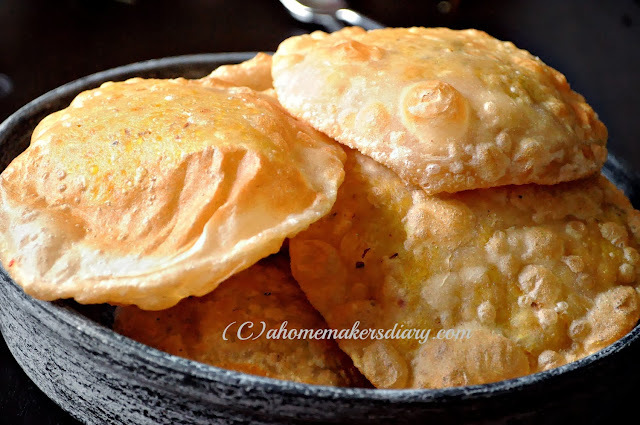 Hing kachori we already do with rasse wale aloo or kaddu ki subzi. Lovely clicks, and the entire platter looks inviting and delicious. That is a nice meal. Love the clicks. 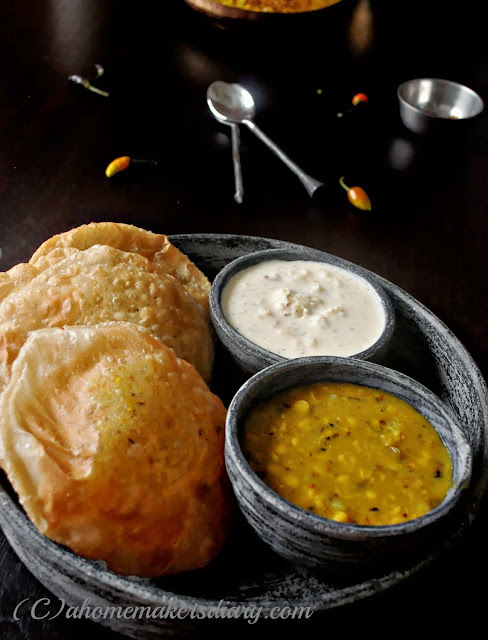 Amazing looking poori's love the complete meal..
Poojor onek subhecha Sayantani. amar i lobh lege jachey. have to make the kochuri soon!!!! Drooling....ki lobh je dilam. Love the new look of your blog, pujor saje darun. Khub bhalo katuk tomar pujo. A comfort food cannot be described any other way. Looks yummy and liked a pictures a lot. thats a delicious meal. a friend had told me about hing kachori just recently. have to try it in my kitchen. the chola dal is a favorite and the combo with the kachori is awesome. BELATED BIRTHDAY WISHES! NICE POST AS USUAL. belated birthday wishes to both of you. as usual lovely post. Gorgeous pictures! 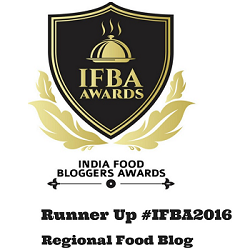 You made me hungry, loved your blog. I love Bengali food, I've been making them at home also, this is going be on the menu soon, very tempting Sayantani..
Hi Sayantani, just loved reading through this post. Kachori and chana dal is unusual for me but looks so good. BTW, was following your cake recipe, would love to know what oven you use ? Boz I am also looking for one. Thanks a lot Sayantani for stopping by my space and sharing your comment. I'm a huge fan of your blog and a comment from you was like the best b'day present :-) Loved your post here! 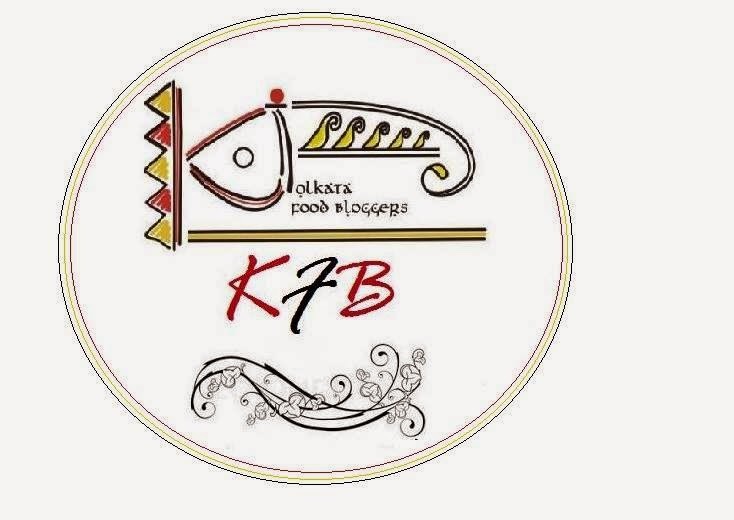 searching for the recipe of kachori i just got to know about your blog..just a wonderful place to find everything right from recipies to crafts..and satti kore 'gorom gorom kachuri' khabar lobhei ami amar bari jai shaktigorh hoe by bus..tomar ei 'kochuri blog'setai mone korie dilo. thanks a lot.